Embattled broadcaster Don Imus' professional fate depends on the CBS Corporation, now that MSNBC has stopped simulcasting his morning program. Pressure from advertisers and politicians have mounted on the radio host since he referred to the Rutgers female basketball players as "nappy-headed hos" last week. CBS Corp. owns both the radio station WFAN-AM that is the host's broadcast home, and the syndicator Westwood One, which distributes "Imus in the Morning" to stations across the country. It is also the parent company of CBSNews.com. CBS Radio, which has also suspended Imus for two weeks without pay, said it would "continue to speak with all concerned parties and monitor the situation closely." Imus said he had met Wednesday with CBS chief executive Leslie Moonves and other executives. "MSNBC folded up yesterday, so we're just on the radio, and I didn't sense a lot of courage on the part of the people at CBS," Imus said on the air Thursday. 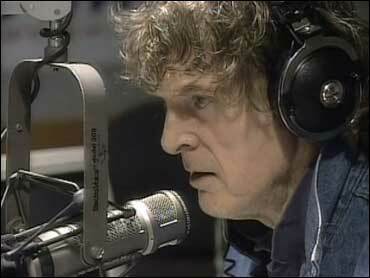 Imus pushed ahead with his annual on-air charity fundraiser Thursday. "This may be our last Radiothon, so we need to raise about $100 million," Imus said at the start of the event, which has raised more than $40 million since 1990. It was one of the reasons that his suspension from CBS does not start until next week. "I've been running my mouth for 30 years and I've said some stupid stuff," he said. But this time, he continued, his remarks were "really stupid." Imus said Thursday said he had apologized enough and plans to meet with members of the Rutgers players. "At some point, I'm not sure when, I'm going to talk to the team. That's all I'm interested in doing." One report said that meeting might occur Thursday. It emerged Wednesday that a key to pulling the plug on his MSNBC simulcast was an internal mutiny within NBC. About 30 angry NBC News employees, many of them black, met with news division president Steve Capus and said they'd had it with Imus' brand of coarse ethnic humor. "Within this organization, this had touched a nerve," Capus said Wednesday. "The comment that came through to us, time and time again, was `when is enough going to be enough?' This was the only action we could take." "If I was the decision maker today, knowing what I know, I could not keep this guy on my payroll," Bruce Gordon, former head of the NAACP and a director of CBS Corp., told CBS News. The Rev. Al Sharpton, who has sought Imus' firing, said he will meet Thursday with CBS officials. There were protests on several college campuses Wednesday, including Rutgers and Emory University. A growing list of sponsors — including American Express Co., Sprint Nextel Corp., Staples Inc., Procter & Gamble Co., and General Motors Corp. — had said they were pulling ads from Imus' show indefinitely. Imus' program is worth a total of about $15 million in annual revenue to CBS Corp., through advertising on WFAN and syndication fees received from MSNBC and Westwood One. It wasn't clear how much of that total came from MSNBC. Two black on-air personalities at NBC News, reporter Ron Allen and the "Today" show's Al Roker, had already publicly urged Imus' firing on Web log entries. Allen said he didn't buy the argument that Imus was "edgy" and had hurled slurs at many others. "Personally, I don't think being an `equal opportunity' insulter makes this OK," he said. Roker said he was tired of cruelty that passes for funny, humor at other people's expense. "He has to take his punishment and start over," Roker said. "Guess what? He'll get re-hired and will go on like nothing happened. CBS Radio and NBC News need to remove Don Imus from the airwaves. That is what needs to happen. Otherwise, it just looks like profits and ratings rule over decency and justice." Democrat Barack Obama on Wednesday became the first presidential candidate to call for Imus to be fired. "He didn't just cross the line, he fed into some of the worst stereotypes that my two young daughters are having to deal with today in America," said Obama, the only black candidate in the race. Imus has apologized repeatedly for his comments. He also has said that those who called for his firing without knowing him, his philanthropic work or what his show was about would be making an "ill-informed" choice. Imus' program has been the only thing MSNBC has aired on weekday mornings for the 11 years of the network's existence. MSNBC loses a morning show personality at a time when his show has been doing very well. Almost as many people had been watching the telecast of his radio show than the highly-produced newscast on CNN — leading CNN to dump its two morning anchors just last week. Producing its own morning show will also cost MSNBC money at a time it has been cutting costs, but it doesn't have the threat of an advertiser boycott.